Avid announced a series of bundles that pack low to midrange M-Audio gear with a new version of Pro Tools aimed squarely at the amateur market. How does it stack up to the competition? 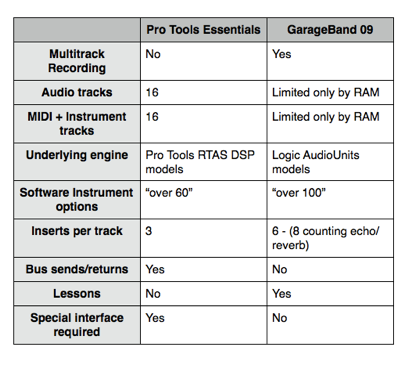 My inner cynic, though, says many people who buy a PTE bundle will end up feeling gypped because they thought they were getting the “real” Pro Tools and not some stripped down lameness that can’t do half of what GarageBand, a free program, can do. Not to mention that for all it leaves out, PTE includes what is probably the most hated feature of Pro Tools: hardware lock-in, albeit they did ditch the dongles and allowed the interface to serve this task but that’s not that much better. Have fun with that hissy Fast Track; you’re going to need it for awhile if you use this program.